The magic of Thai food is founded on the balance of the five flavours: sour, sweet, salty, bitter, and spicy. What then differentiates Thai food from other cuisines that employ taste balancing are the ingredients that are used to bring each flavour to the mix. 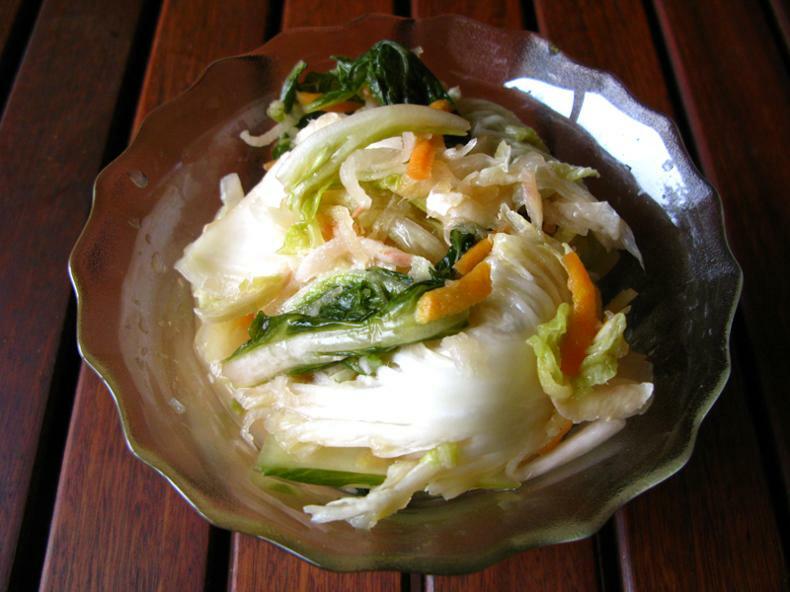 Vegetables, fruit, herbs, spices, and condiments are all used to contribute to the final dish, and for this white kimchi in Thai style, I utilise many ingredients that will be familiar to those who love Thai food. These are the steps you need to take to make your very own Thai-chi. 2 spring onions (sometimes called shallots in other parts of the world – this is the small, white, leek-like onion with a white head and green tops), cut on the diagonal. 6 or more kaffir lime leaves, whole. Take two good sized, organic or chemical free wombok (Napa) cabbages, and three or four similarly clean bok choy. Remove the scrappy outermost leaves (if any), then take the first good outer leaves of the cabbage, and put these aside. Examine the cabbage for any insect or grub holes, cut these out until any critter and damaged foliage are removed. Chewed leaves are OK if they are healthy and relatively intact – the action of invertebrate chewing activates the potently anti-cancer glucosinolates in all cruciferous vegetables. Bok choy needs less cleaning up, use the maxim ‘if you wouldn’t eat it, don’t ferment it’. Cut all cabbages (bok choy is technically a kind of cabbage, and higher in vitamin A potential than any other cabbage). Chop these into rough 2 x 3 inch squares, it doesn’t really matter what size they are, just as long as they are not shredded. Weigh the chopped veg, then add 3 tbsp of salt for every approximate kg of veg. Place the veg into some large bowls, add the salt, and rub it into all the surfaces. Give a quick but gentle massage, cover the bowls with a tea towel or cloth, then leave for round about 4 hours. Now make the Thai master stock. You should always make this if you want to make Thai food. Add a little to each dish and it will add coherence to even the most diverse flavours offered. The exact amounts will depend on the freshness of your ingredients, and the intensity of their taste. Use the recipe below as a rough guide, and adjust the fish sauce, soy sauce, salt, lime juice and sugar toward the end of cooking to achieve the required balance. Simmer the onion in the water on a low heat for 5 minutes or so, then add the galangal, lemon grass and lime leaves. Low simmer for 10 minutes, then add about half of the other ingredients. Simmer for 10 minutes more, then taste. Add the remainder of the other ingredients to achieve your own personal balance of the flavours. Put the master stock aside so it is well cooled before using, and make a standard sticky rice porridge as you would for any kimchi. For those who have never done this, I will explain that now. In a small pot, add the rice flour, then stir in the water to make a smooth liquid. Turn the heat to low medium and cook for 10 minutes, stirring often, until the liquid bubbles and thickens to a smooth porridge. Add the raw sugar, then stir and cook for another minute. Turn of the heat, and let this cool completely before using. Julienne the carrot and radish, chop the spring onion, and put in a big bowl. Add a good dash of fish sauce and stir well. Take the onion, garlic, pear (or apple), and ginger and cut finely, in a food processor if you have one. Add this to the bowl. Combine the porridge and Thai master stock with the vegetables, add finely chopped lemon grass and whole kaffir lime leaves, then stir well. Drain any liquid (brine) from the cabbage and bok choy, and reserve the brine. We might use this later. Divide the vegetable paste evenly between your bowls, and coat the cabbage and bok choy well with it. Lick your fingers. How salty does it taste? If it doesn't taste noticably salty, add brine until there is a good salt tang. Mix again for luck, and then transfer to your fermenting vessel(s). 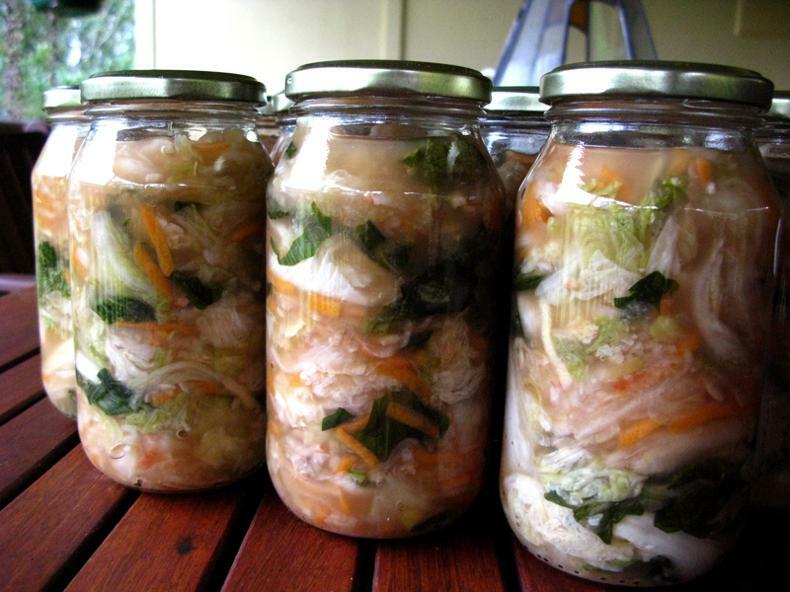 This is a light kimchi with a high salt perecentage that favours secondary and tertiary fermentation species, so a week is all that is needed. Because we only ferment this for a week, precautions to guard against mould are not absolutely necessary. That means you can get away with fermenting in a crick without a moat, or in jars without an airlock (but remember to monitor pressure and release as necessary. Once fermented, decant to sterilised jars, let sit on the bench or in the cupboard for a few days to build up a headspace of CO2, then store in the fridge. If Celestial Roots free information has helped you in any way, please consider a donation to help keep me doing what I do.